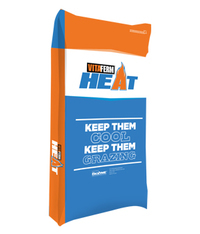 VitaFerm® HEAT™ is a line of vitamin and mineral supplements for beef cattle used to reduce heat stress during temperatures of 70 degrees and above, or anytime cattle are grazing fescue. Contains the Amaferm® advantage and Capsaicin, both research-proven to lower body temperature, which can improve conception rates by maintaining pregnancy. Includes garlic, a natural insect repellent. Heat Stress Means Less Performance While most don’t think of heat stress until it is hot outside, it is important to know that cattle can become heat stressed at temperatures of 70 degrees and above. When temperatures reach 70 degrees and above. If you are looking for natural insect control. How VitaFerm HEAT Can Help A vitamin and mineral supplement for beef cattle used to reduce heat stress during temperatures of 70 degrees and above, or anytime cattle are grazing fescue. Warmer temperatures are quickly approaching, and that means producers should start considering how to help their animals handle the heat. Heat stress is almost inevitable, but some management practices can be implemented to help animals better cope with rising temperatures. All mammals regulate their internal body temperature involuntarily. Heat stress occurs when the animal’s ability to self-regulate and lower core body temperature is overwhelmed and the animal’s performance and/or health is compromised.